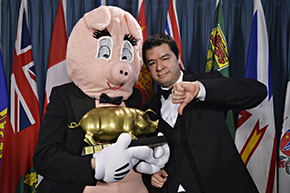 OTTAWA, ON: The Canadian Taxpayers Federation (CTF) today held its 20th annual Teddy Waste Awards ceremony, celebrating the best of the worst in government waste from the past year. 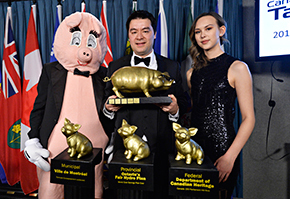 CTF Federal Director Aaron Wudrick served as host, joined by the CTF’s pig mascot Porky the Waster Hater and talented event hostess Jessica. The awards event took place on Parliament Hill in the Charles Lynch Press Theatre. 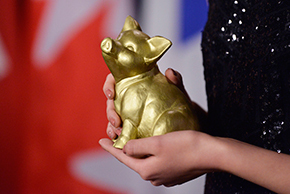 The Teddy, the pig-shaped award given annually by the CTF to government’s worst waste offenders, is named for Ted Weatherill, a former federal appointee who was fired in 1999 for submitting a panoply of dubious expense claims, including a $700 lunch for two. 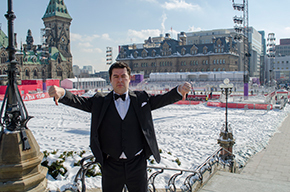 As part of the celebrations commemorating Canada’s 150th birthday, the Department of Canadian Heritage built a temporary outdoor skating rink on Parliament Hill at a cost of $8.2 million – or approximately $100,000 per day and $53 per skater. Incredibly, it was built just one block away from the Rideau Canal, which is widely known as Canada’s most famous outdoor skating rink. “Any temporary rink costing millions of dollars is a project that should have been put on ice from the get-go,” said Wudrick. “Even for a government with a long track record of waste, this cynical act of kicking the can down the road is truly breathtaking,” noted Wudrick. The City of Montreal spent $34 million trying to attract the Formula-E race, F1's electric-powered cousin, even creating a new downtown circuit and buying new safety fences and equipment. The 2017 event was a flop, selling only 25,000 out of 45,000 tickets and featuring mostly empty bleachers. “By any measure, $34 million on a race nobody wants to watch is not a winning formula,” said Wudrick. 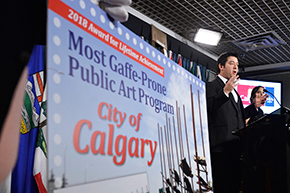 The City of Calgary has a long track record of wasting taxpayer dollars on public artwork stretching back to the inception of its public art policy in 2004, and Calgary public art projects previously garnered a Municipal Teddy nominee in 2015 and a winner in 2016. 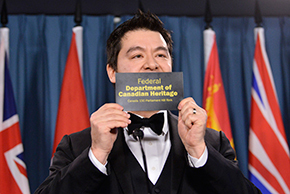 Federal – Finance Canada for spending $192,000 on graphics and advertising for the federal budget. 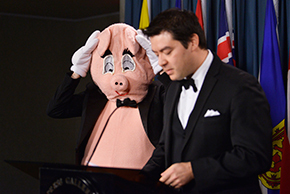 Federal – Health Canada for spending $100,000 per year to operate the minister’s Twitter account. Provincial – Danny Graham, CEO of Engage Nova Scotia for getting a $163,000 salary despite not being able to explain what Engage Nova Scotia does. Provincial – SaskPower for previously maintaining a fish pond in its Regina headquarters at an annual cost of $20,000. Municipal – The Toronto Transit Commission for its $1.9 million “word art” project that remains dormant due to fears passengers will use to type profane words. Municipal – The United Firefighters of Winnipeg for taking a 40% taxpayer subsidy for their union president’s salary. Click here for our backgrounder on all 2018 Teddy Award nominees and winners. Well done to the Taxpayers team to highlight a few of the most egregious ways governments waste our tax dollars. Sadly, many hard working CA families must scrimp to make ends meet, and adhere to a stringent budget. Apparently, if you grew up with a trust fund, or have been in office too long, managing a real budget was never a necessesity, or a far too distant memory. Even sadder, building a strong economy by developing our resources, equity of opportunity, reducing taxes, and growing commerce is no longer our #1 priority. As it turns out, apparently, "the budget will not take care of itself?"